As a student and teacher of yoga, we are always learning, and learning about learning. The journey of practice is deep and wide, and as we learn more about ourselves, we also are able to see in others. Howard Gardner’s book, Frames Of Mind (1983) became a model to understand and teach aspects of human intelligence, learning style, personality and behaviour. 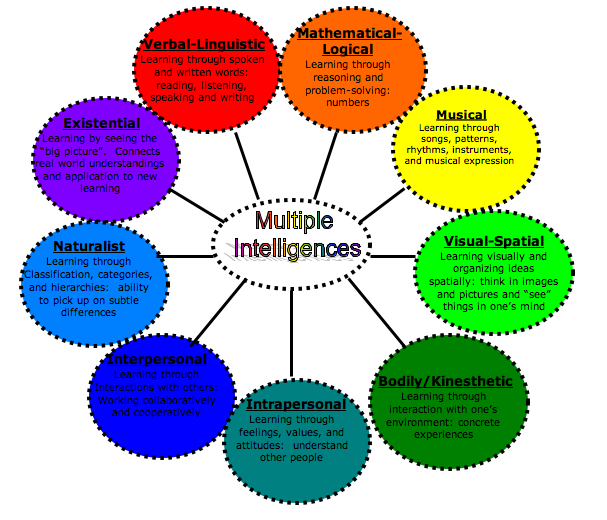 The multiple intelligences theory represents a definition of human nature, from a cognitive perspective, ie., how we perceive; how we are aware of things. 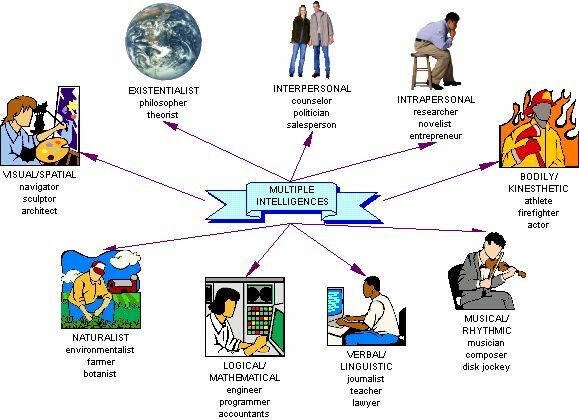 This provides an indication to people’s preferred learning styles, behavioural and working styles, and their natural strengths. 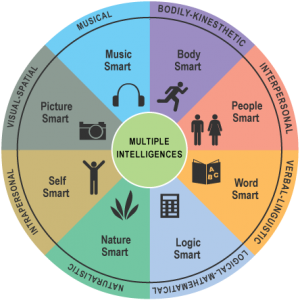 The types of intelligence that a person possesses (Gardner suggests most of us are strong in three types) indicates not only a persons capabilities, but also the manner or method in which they prefer to learn and develop their strengths – and also to develop their weaknesses. A person who is strong musically and weak numerically will be more likely to develop numerical and logical skills through music, and not by being bombarded by numbers alone. A person who is weak spatially and strong numerically, will be more likely to develop spatial ability if it is explained and developed using numbers and logic, and not by asking them to pack a suitcase in front of an audience. A person who is weak bodily and physically and strong numerically might best be encouraged to increase their physical activity by encouraging them to learn about the mathematical and scientific relationships between exercise, diet and health, rather than forcing them to run or play tennis. The pressure of possible failure and being forced to act and think unnaturally, have a negative influence on learning effectiveness. Happy relaxed people learn more than unhappy stressed people. Develop people through their strengths and we stimulate development, grow confidence and lift spirits. People have a set of intelligences – not just one type and level. Intelligence is not the single aspect of a persons capability. Intelligence is a mixture of several abilities that are all of value. But nobody’s good at them all. We need people who collectively are good at different things. 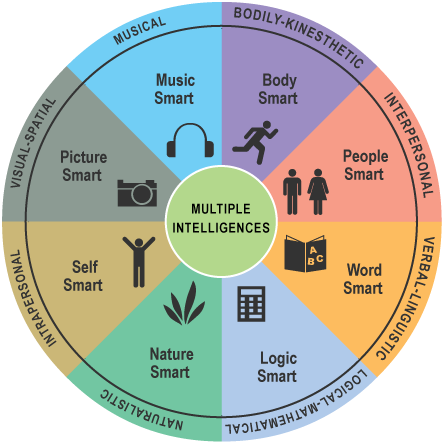 A well-balanced world, and well-balanced communities are made of people with mixtures of intelligences. This gives the group a fuller collective capability than a group of identically able specialists. 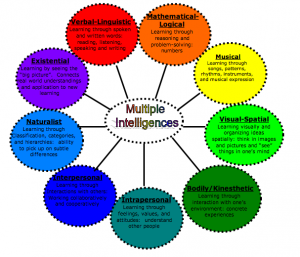 Here’s some info on Multiple Intelligence and quizzes to check your own learning. 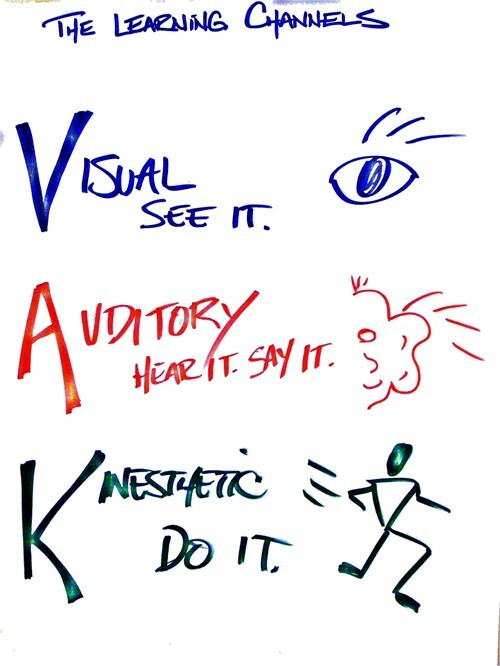 Each person prefers different learning styles and techniques, and we all have a mix of learning styles. 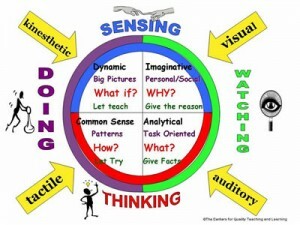 You may find that you have a dominant style of learning, but may use different styles in different circumstances. Your learning styles have more influence than you may realize. Your preferred styles guide the way you learn. 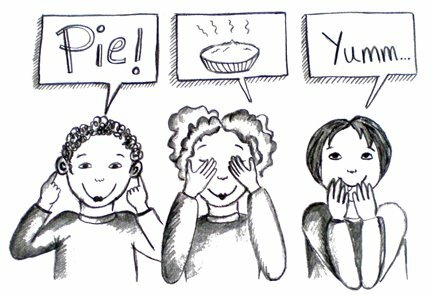 They also change the way you internally represent experiences, the way you recall information, and even the words you choose. Visual: The occipital lobes at back of the brain manage visual sense. Both occipital and parietal lobes manage spatial orientation. Verbal: The temporal and frontal lobes, especially 2 specialized areas in the left hemisphere. Physical: The cerebellum and motor cortex (at back of frontal lobe) handle much of our physical movement. Logical: The parietal lobes, especially left side, drive our logical thinking. 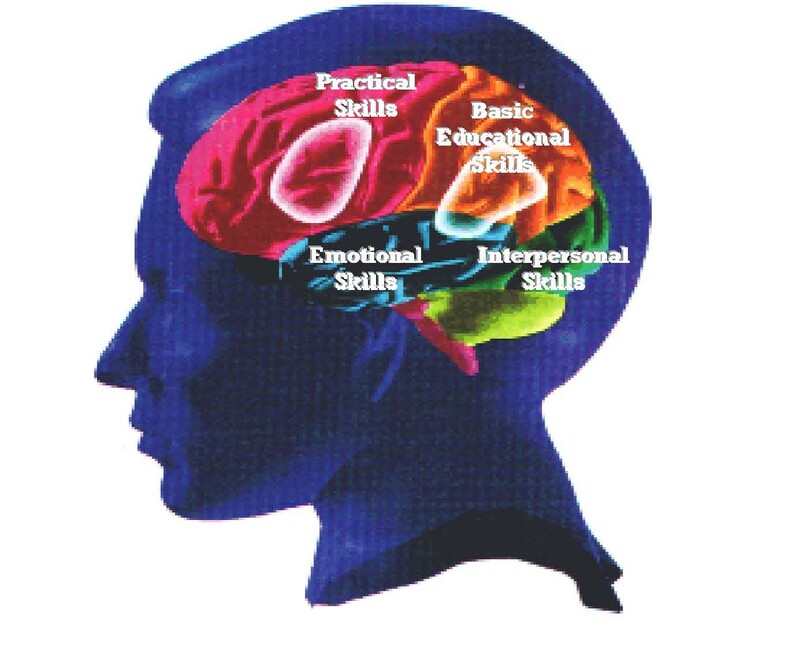 Social: The frontal and temporal lobes handle much of our social activities. The limbic system influences social and solitary styles. The limbic system has a lot to do with emotions, moods and aggression. Solitary: The frontal, parietal lobes, and the limbic system, are active.